Lisa and I took the first half of today off from the convention for a mundane task: laundry. We're about halfway through our trip and we were starting to run out of clean clothes. I previously had tracked down a coin laundry only about 1 km from the Greektown People Mover station, which is not impossibly far away. After breakfast we packed our laundry into a couple of bags and rode the People Mover from Cobo Hall (across the street from where we are) to Greektown, then walked down Lafayette to a decently equipped laundromat. As a bonus, they had a pinball machine, so we were kept occupied for the time it took us to do a couple of loads of laundry. On the way back, we stopped and had lunch in Greektown. Instead of taking the People Mover back to the hotel, we walked, as we needed it after the nice lunch. 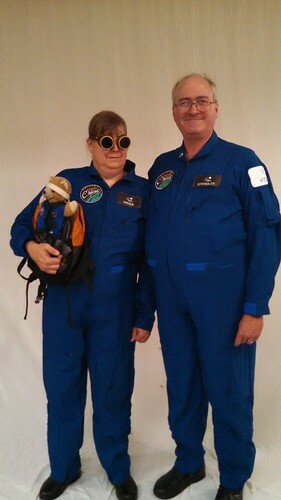 The convention day was more than half over, but we finally headed over there after changing into our WSFS jumpsuits from Chicon 7. 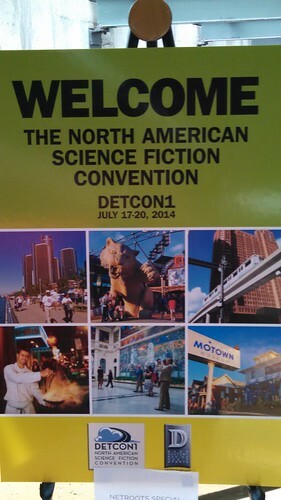 The hotel had this sign welcoming attendees. 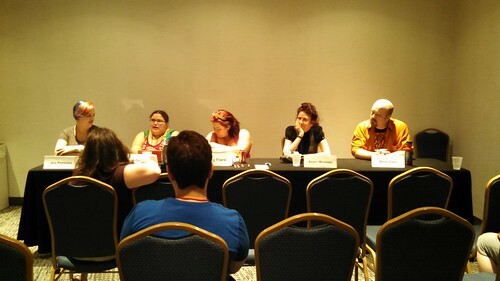 I actually went to a panel on which I wasn't a participant: "Real Geek Girls." Don't let this photo fool you; there were plenty of people in the room. After seeing programming, Lisa and I actually had enough time to look through the Dealers Room and associated Exhibits except the Art Show because Lisa would have had to stow her backpack, which contains her tinnitus-masking sound generator as well as travelswithkuma. Near the back of the room was the list of all past NASFiCs and an invitation to sign in and to collect stickers from gerisullivan indicating how many NASFiCs you have attended — in my case, four five, including both Detcon 1 and CascadiaCon where I was Fan Guest of Honor. We found our way up to the Con Suite on the 69th floor for a while, then later went down to the food court (the big lunch meant we weren't that hungry) with pcornelius. After dinner, the Parties awaited. We made the rounds of the parties, except for those too loud or too drunken (or both) to appeal to us. Among those we visited were the Finland in 2017, DC in 2017, and New Orleans in 2018 parties. We ended the night at the Slan Shack: a suite used for programming during the day and being hosted by Geri Sullivan as a faanish party that night; It was open and airy and comfortable, and I was was glad to be there. I'm afraid that I sort of took over one bay of the suite for about an hour of a heavy duty SMOF session; on the other hand, what started as a relatively small discussion with Dave McCarty dealing with mechanical issues with WSFS committees on which we serve morphed in to much longer and more complex conversations as more and more people arrived, seemingly drawn to our discussion of Business Meeting arcana such as my contention that we seriously overuse Objection To Consideration when there are other, kinder mechanisms for trimming our agenda of obvious non-starters without dropping parliamentary 16-ton weights on well-meaning would-be participants in the process. Just before Midnight, Lisa pointed out that we really needed to head out and the conversation broke up. The People Mover runs until 2 AM on Friday/Saturday morning, so we rode it back to the hotel. Some of the other people on the car knew that there was an SF convention in town and asked if we were supposed to be the Ghostbusters. "Not quite," I said. They were very friendly about it, I might add. Tomorrow is Baseball Day, as we have tickets for the Detroit Tigers-Cleveland Indians game. Kuma Bear is sad that it isn't the Seattle Mariners playing.